I still enjoy a visit to Brighton Station. Now I appreciate the Victorian engineering and architecture, and marvel at the mighty logistical operation that is our railway, but as a child it was the trains themselves that enthused me. Railways stations are – or should be – the hubs of our transport network. They are inherently exciting because they can take you to new destinations – and bring you home again. We used the trains a lot for day-trips, holidays, or visiting relatives – exciting journeys. Mum even used to take me to the station as a treat! The giant, manually-operated indicator board would spell out odd names like ‘Barcombe Mills’ among the more familiar London, Worthing, Lewes, etc – helping to build my geographical awareness. There was a machine with a large dial which, for a penny or two, would stamp your name on a metal plate – I never understood the purpose, but it was fun. Outside, by the bus stops, was a giant, coloured Geographia plan of Brighton and Hove, much better than the sixpenny corporation ones. I’ve always been a big fan of maps. One journey in 1971 took me along the fascinating Kemp Town branch line on its last day of operation, on a special passenger service. Now my wife and I use the trains mainly with our bikes, for days out or holidays. The name-stamping machine’s gone, the indicators are electronic, and Brighton Station is now a bright and airy place, but it remains a stimulating location full of activity. Tim. As a 4 year old (those were the days), I would wander from my home in Gloucester Street, through the beehive activity of Sydney Street, up Trafalgar Street to the station and sit and wonder at the mighty steamers and huge edifice that was the Brighton station. It is a source of pleasure to recall the sense of power and order in the universe of a child that even 55 years later is so potent! Thanks for the reminder and your superb historical work – you have a world wide audience. 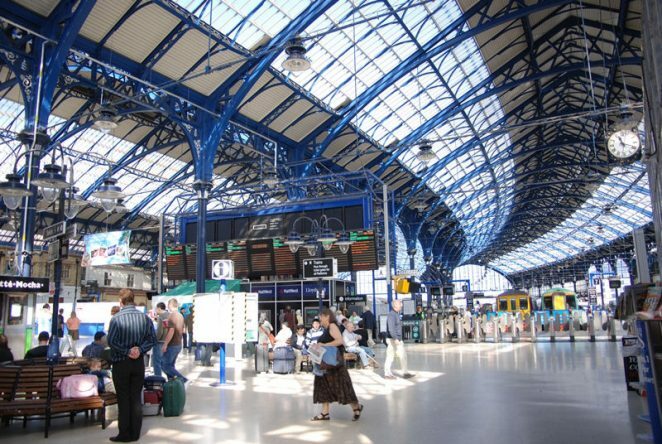 I have wonderful memories of Brighton Station as a kid. Using the 5/- runabout ticket that lasted for 7 days and would take you to either Hastings to the east, or Portsmouth to the west. Playing in the Boys Brigade band on Remembrance Sunday. And later I met and married Ronna who ran the flower stall for 20 years at the top of the steps that led down to the gents toilets and Trafalgar Street where there was a hairdressers that always smelt of perm solution. Ronna met lots of famous people: Chris Eubank, Ken Livingstone, Eamon Andrews, etc and had seen all the changes in those years, eventually giving it up when we moved to Spain. In the 50s as kids, a mate and I would buy a platform ticket for threepence if I remember right. Then we often would sneak onto a train and go for a ride just to a local station like Hove or Southwick, sometimes Lewes. The farthest we ever went was to Littlehampton where the train stopped as it was the end of the line and we did not have to get off. We did this a few times, always scared that we would get caught and have to walk home. Back at Brighton off the train, pass the platform tickets over to the porter on the gate and that was that. Obviously we had to have our wits about us and be sneaky about it for fear of getting bad earache or worse, the police. Fun days for kids, a bit naughty but fun all the same.